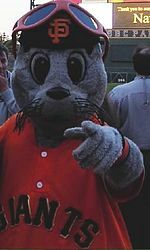 The 1996 San Francisco Giants season was the Giants' 114th season in Major League Baseball, their 39th season in San Francisco since their move from New York following the 1957 season, and their 37th at 3Com Park at Candlestick Point. The team finished in fourth place in the National League West with a 68-94 record, 23 games behind the San Diego Padres. This page was last edited on 5 August 2018, at 21:39 (UTC).